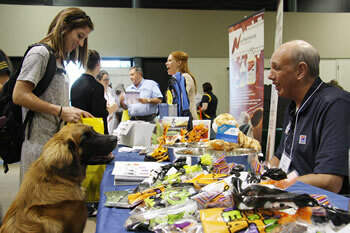 Hill’s Pet Nutrition representative Dave Rosen talks to second-year veterinary student Abby Romano as her dog, Rooney, eyes some of the treats Rosen has available at his table during the CVM Veterinary Products Night. Twenty-one companies and agencies participated in the 20th annual MU College of Veterinary Medicine Veterinary Products Day held Oct. 18 in the Adams Conference Center. The networking event brings together veterinary students with representatives from animal care and nutrition companies, veterinary interest businesses and the government. 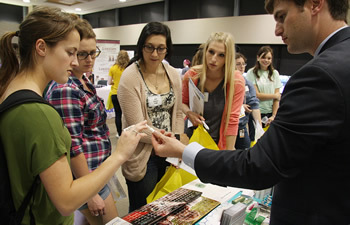 The forum, which allows students to learn about animal nutrition and care products, careers opportunities and professional services, attracted approximately 400 veterinary students. 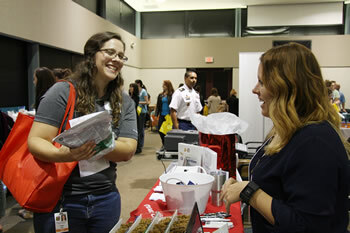 Jamie Huff, VM-2, meets with Royal Canin representative Jenny Sandler. Companies and agencies attending included, Addison Biological Laboratory, Banfield Pet Hospital, Boehringer Ingelheim, Ceva Animal Health, Dechra Veterinary Products, Hero Braces, Hill’s Pet Nutrition, iVet, Merck Animal Health, Merial, MWI Animal Health, Nestle Purina Pet Care, Norbrook Inc., NutraMax Laboratories Laboratories Veterinary Sciences, Inc., Pet King Brands, ProPartners Wealth ― AVMA Life, Radiologic Resources, Royal Canin, U.S. Army Healthcare St. Louis, USDA Food Safety and Inspection Service, and Zoetis. 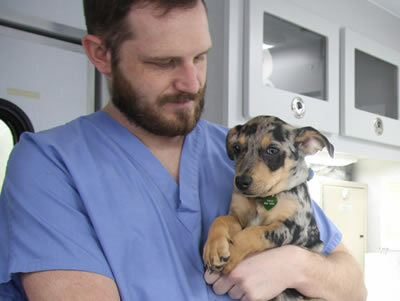 MU CVM alumnus Nicholas Perez, DVM, a member of the class of 2013, represents Merial. He discussed the company’s products with second-year students (from left) Jerrianne Whittmore, Jordan Flewellyn, Jet Jones and Andrea Ernst. The evening included a food buffet featuring a variety of appetizers, as well as drawings for prizes and scholarships. Winning $500 scholarships each were: Aaron Wilson, VM-1; Jennifer Blakely, VM-2; Carissa Cruz, VM-3; and Kari Deininger, VM-4. Other drawings included a $50 iTunes gift card from Hero Braces, won by Neha Sharma, VM-1; a stethoscope and Shakespeare’s gift card donated by AVMA Life, won by visiting scholar Nancy Chen; 12 months of Vectra 3D donated by Ceva Animal Health and won by Emily Goyda, VM-2; and a $25 QuickTrip gift card and $40 in gift cards to the Zou Cafeteria from Hills Pet Nutrition, won by Rhiannon Koehler, VM-2.